The Sleep Body Wash, 10 oz. is fast-foaming, infused with soothing skin conditioners, while an aromatherapy blend of essential oils and natural ingredients benefits body, mind and mood. 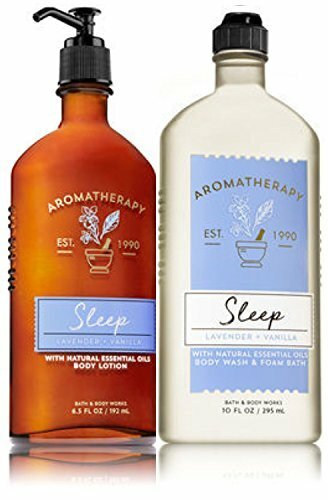 Bath and Body Works Aromatherapy Lavender Vanilla Body Lotion 6.5 fl oz.-Lavender Essential Oil and Vanilla Absolute help calm feelings of stress so you can sleep better. This ultra-creamy, nourishing body lotion is formulated to give skin long-lasting moisture. This formula contains precious botanicals and minerals White Water Lily and Malachite are known to help soothe skin so it looks and feels its best.Formulated to provide all day moisture Breathe deeply for best results. Fragranced with essential oils and other natural fragrances. Not tested on animals, One bottle of each in this pack. This fast-foaming body wash is infused with soothing skin conditioners, while an aromatherapy blend of essential oils and natural ingredients benefits body, mind and mood.